We gained two extra living spaces with the renovation of our farmhouse. 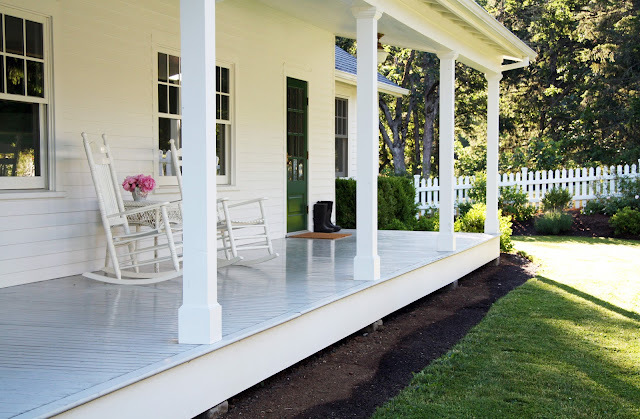 The first of these outdoor 'rooms' is the wraparound porch, which provides a transition between indoors and out. 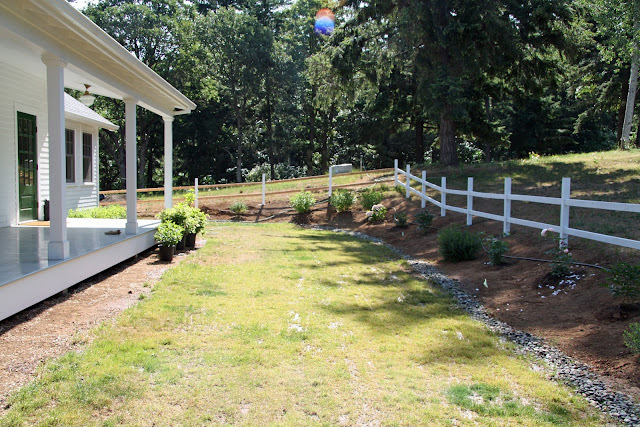 The second is the yard we created around the house with picket fence, which transitions from the house to the rest of our property. To address some long standing drainage issues, we excavated to slope the ground away from the front of the house. After we excavated this area, there was a transition in elevation up to the rest of the yard. We decided to take advantage of this break in grade to create planter beds, which also disguises the varied ground elevations. 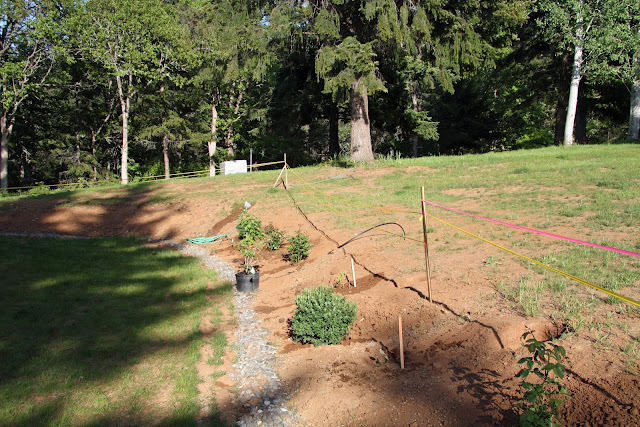 Choices we mulled over included lots plantings associated with either a retaining wall or a fence line. We decided on the latter. Here, Mike has staked out the proposed fence line. The gravel border to the left of the future fence is a french drain, which we installed to help collect and convey water away from the house (and basement). Mike and my Dad dug the holes one weekend, while Mike and his Dad set the posts the next. They are set in concrete so that they remain straight through rain, wind and snow. This is an old photo so the file is small. 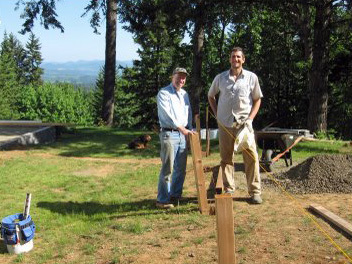 Both being engineers, you can be sure that our fence is strong. Here is the yard today. There is of course always more planting to do, but each year the beds get fuller and fuller. We have held off on plantings around the porch so far. We can't decide if we prefer it left open, or if a line of low-growing shrubs or flowers may add a nice touch. It is a challenging spot to pick plants for. The area receives direct sun all summer long, and occasional piles of snow coming off the roof in the winter. The grass outside of the fence line has started to yellow, as it does around this time every summer. We've opted to only irrigate the yard inside the fence line, and let Mother Nature take care of the rest. Here's the side yard just after we completed the fence. Here is the side yard today. There are a few more posts on the fence here, here and here. Hmm, where could he be? Just beautiful! What a beautiful view to enjoy also! Do they make house calls? I LOVE that fence! I just planted some lavender along the edge of my deck.. it will grow almost the the height of the floor, and be so pretty and fragrant... that is when it finally grows and fills in.... did I mention I have black thumbs? You have a beautiful house! One word comes to mind - cozy !!!! Oh my GOSH it looks so good, you have done SUCH an amazing job in every single transformation on that awesome farmhouse- WOWZA!!! I highly suggest planting boxwoods around the porch. They are always green, tidy, fast growing, clean, maintenance free and handle cutting so eventually you could have a very nice low Boxwood hedge surrounding your porch - or the rounded Boxwoods lined up could be amazing, too. As for for your hide n seek cutie, I actually sighed out loud, what an ADORABLE picture/s!!!! I absolutely love a white, picket fence. And yours turned out beautifully. 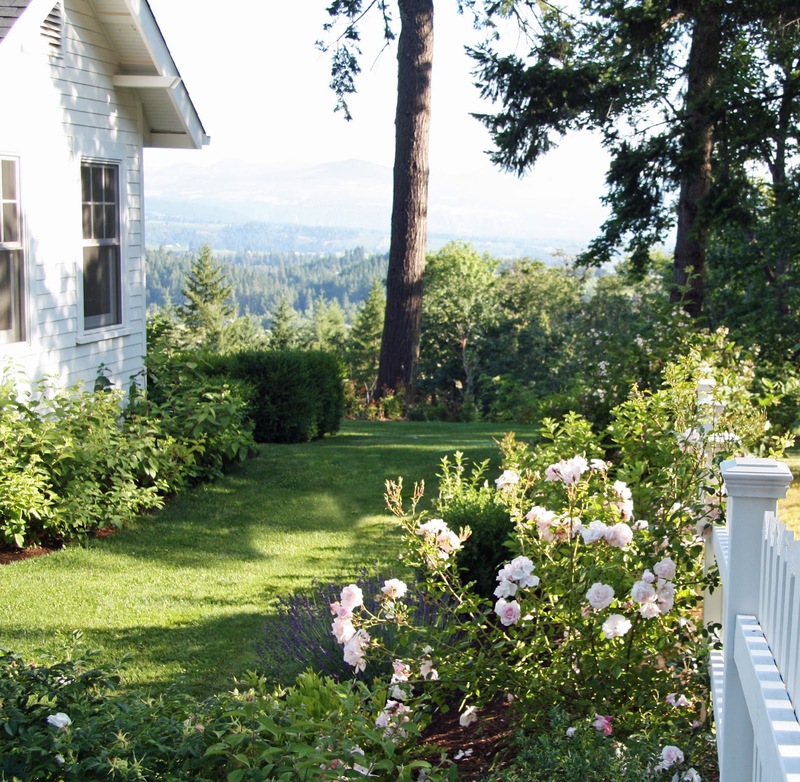 The photo of the view with the roses against the fence is perfection. 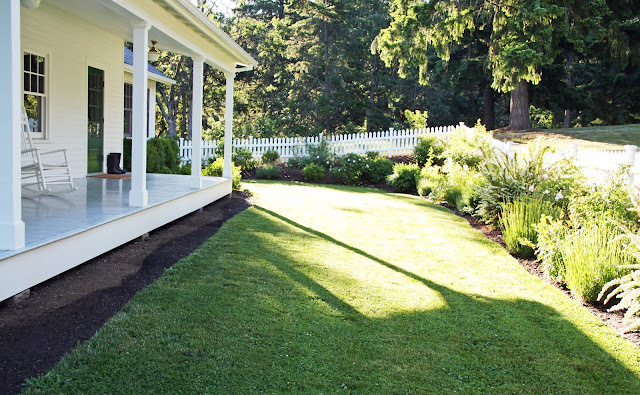 And I like the open, unplanted area around the porch. It seems like the outdoor equivalent of 'a place for the eye to rest' as decorators often say interiors should have. How sweet is he?! I am absolutely in love with your fence! I'm sure it reminds you of your time in New England. A bit of New England style in the Pacific Northwest. Beautiful photos, as always, Trina. Simply gorgeous. It is amazing to see how your outdoor space has transformed in a few years... seeing your yard transformation gives me a teeny bit of hope that maybe one day our yard won't look like excavated bare dirt. Your hard work has paid off and how wonderful now you can enjoy such beautiful "rooms" outside! I love the picket fence, and your garden is beautiful. lovely- what about planting some veggies for the children to pick....or some low shrubs....or lavender? I know you will come up with something wonderfully simple. I think you need to find it on the Internet. So cute!! Love Graham's chubby little legs! 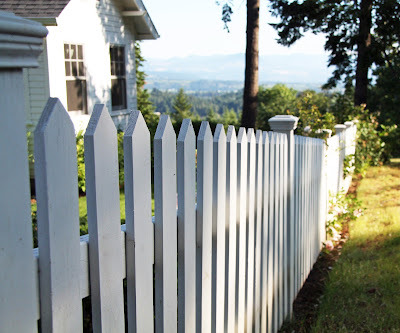 I miss having a picket fence...*sigh* everything is so sloped in our current house, it would be crazy! Snow?! You must live near Sandy?? I guess PDX does get it more regularly than those of us in the valley. Looks like a dreamy place to spend summer days. I just love before and after photos. Beautiful! I am enjoying this more than usual , since we have decided to sell our home here in Buenos Aires and move back to NY. This time to live Upstate in a more country setting. With trees and views and no neighbours .. be still my heart !! Thank you so much! I'll have to get the story for the babies. They LOVE their books. Such a beautiful home and setting. Picture perfect! Love "hide and seek" Graham . . .
Trina, your home and gardens are so lovely. I hope you don't mind sharing with us how you and Mike keep your planting beds so fastidiously weed-free. Beautiful, Trina! Love your yard! Have you ever shared which camera you use? I am curious - your photos are always fabulous. Love everything. Sweet Graham playing peek-a-boo is the best! Graham and his chubby legs are killing me!!! What an angel! beautifully done trina. i love the fence and plantings so much as they fill out. i like the house without much planting around it - nice clean look, but i feel like there should be a small plain border there, like a small hedge all the way around. boxwood? I use a Canon Rebel xsi plus Photoshop Elements. Ever since we had the babies, we've had a lawn service come and do the yard. It's heaven! We love it. Your home and grounds are so beautiful. If you ever wanted to you could open a bed and breakfast once the kids are grown up and gone. All that hard work is worth it even tho alot of your summer is being used to do all that work. Just think of wonderful it will be next summer. Maybe some ground hugging evergreens just off the porch. Loved the shots of Graham's adorable little chubby legs and tootsies. Keep that pic forever, it's priceless. I'd like to thank you for sharing your beautiful life and wonderful world. commitment to make it so. You have done a wonderful job. think and appreciate that part of the world. Your whole place is beyond stupendous! It is beautiful! Your husband and you have a made a little bit of heaven. All that hard work has paid off. I live in a big city and always wanted a farmhouse. Yours is truly ideal. I am sure your babies will have lots of fun growing up there! I enjoy every minute of looking at your pics of your pretty home and your beautiful flowers! Your peonies are my favorite! Can't grow them here (too hot). Lavender around the porch would be so pretty and smell so nice and would give such a nice color. It would not grow too tall. They are soft when little ones fall off the porch. I detest boxwoods that have to be cut all the time and snow drips make holes in them. My boxwoods are always covered in pesky spiders too. From someone that has 30 boxwoods around her house. Just an opinion! Your yard and fence...both lovely. I will never tire of seeing of your lovely property. I bet those chubby little toes love that soft grass! I like your porch as is. Wouldn't change a thing. However, it is always fun to keep up with projects on our homes. So, if you add anything to your porch landscape, I am certain it will be beautiful! Trina, I see why you are so happy with the clean lines of the porch - Your engineer men may say, "let's not coverup all our hard work!" Consider pea gravel or flagstone from the lawn to the porch, with drip irrigation to just a few (at least 3) extra large scale pots or cedar planters with annuals (or inexpensive evergreen that you can replace if crushed by a snow load). I just stumbled across your blog after linking off a couple of different blogs! I'm in love with your house and I can't wait to follow your continuing progress! Please take a moment to check out my new blog! Oh, I just want to squuze thos pudgy-wudgy legs!! So cute! The fence came out so great...Mike's handiness is truly a blessing!! I can see what a tough call the porch plantings would be...but I know whatever you eventially go with will be absolutely perfect!! We are in Oregon although our view is of Washington hills and mountains (Mt. Adams). I always favor white when it comes to fences. And you have a lovely outdoor space. Trina how sweet does Graham look behind the curtain and that nursery rhyme was lovely. I remember when you posted about the fence. THat was a big job. You have so many wonderful photos of your home as it has evolved. I hope you do a book for your family (through any of the photo sites available) It would be a lovely coffee table book . You could hard bound it and show from beginnings and befores to afters. It's so easy to make those these days and it would be a lovely keepsake and a family treasure for the twins when they grow don't you think? tyler will be starting our fence project in august and I CANNOT WAIT! if only our yard and views looked like yours...and not NJ. xoxo! 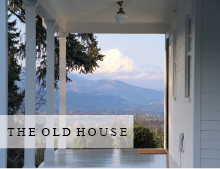 So I just found your blog and I am in love with your house! I told my husband that I want a house like that. The pictures of your Graham brings back so many wonderful memories of our own children hiding behind the curtains, with their feet showing! Love your fence! I'm enjoying all the additions to your lovely home, but the little chubby feet won my heart. I love the openness of the porch, however, if you want some plantings, you may want to consider planting some beautiful and hardy lily's or grasses in front of each post, it will bring nature a little closer and still keep the porch open! Awesome job Trina - give that man his own national TV show! Thank you sweetie for your lovely message this week - baby Gracie has changed all our lives in a heartbeat, we adore her. It is so interesting watching your own kids parent, I had a tear or 2 watching our boy with his precious little girl. Wonderful to see your 2 cherubs growing & thriving. I love this post! Picket fences are one of my favorite things, it just says HOME to me.. I love yours and look forward to putting one up soon! So sweet! 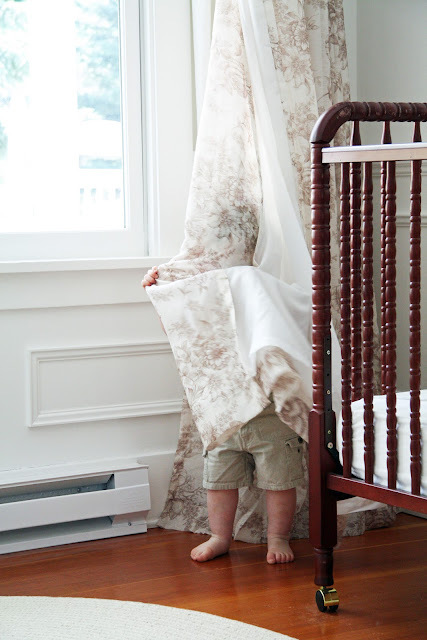 Adore the picture of Graham hiding in the curtains. Beautiful beautiful home and landscaping. Looks just beautiful. I wish our garden was a patch on yours, it's so simple and classic and uncluttered and lovely. Rather like your house - I don't know why we seem to have so much stuff and I don't know where it all comes from or where it can go! 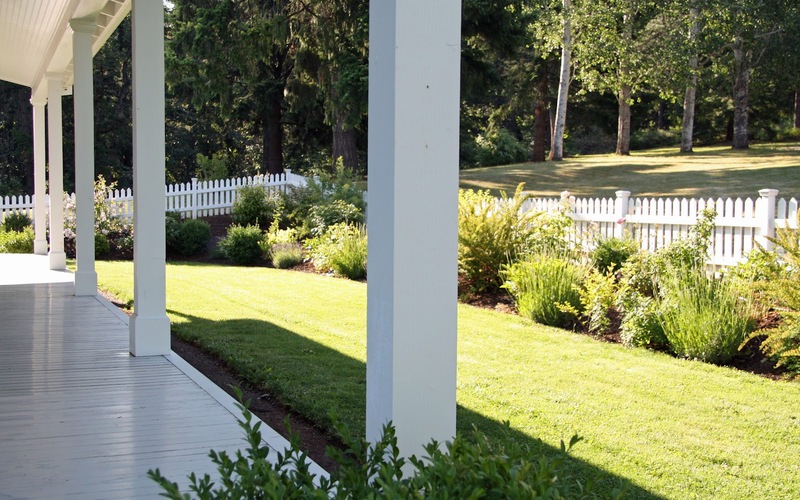 I feel that if you plant anything around the edge of the deck it will "section off another area", close to the picket fence which "squares off" as well. It all looks so beautiful!! If you want to add something around the deck, maybe some flower boxes filled with color? Wow your place is just amazing!!! The fence I just love it all looks so nice!! What plants did you plant by the fence?? Woah! You sand over 300 pickets on your own? Wow. That alone, is indeed a meticulous job! Kudos! :) Well, I want you to know that, your white picket fence is marvelous. :) And it really does complement your flowers. The white on white color combination really never gets old, does it?